It can be very difficult to choose a bike these days. Sometimes bikers often get confused about what is good, especially with all the jargon words thrown around. But I’m going to step in, and break through all of that, to let you know what Merax Finiss 26″ bike has to offer. Is it just another low cost, poorly made alternative to a great bike? Or, are there some advanced features, you wouldn’t expect on a bike at this price? 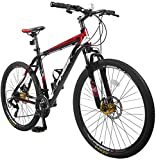 Merax Finiss 26″ Aluminum 21 Speed Mountain Bike with Disc Brakes Review will help you decide how good it is, and whether it’s the right mountain bike for you. Buyers want low weight, durable bikes, and the frame here is Aluminum. By using Aluminum, Merax Finiss have been able to keep the weight down to 33 pounds. This is a good weight for a mountain bike, it will not be difficult to carry around, or to control, and Aluminum will last a long time. Gears are often an area manufacturers seek to cut costs on, but these Shimano’s are good quality and very smooth. Gears are changed from the handlebars, and on some bikes, it can be difficult to change gears, but you can do it here, with one movement. It’s simple and convenient. Derailleurs are what you use to change gears. They connect your handlebars, to the front and rear wheels. When you want to change gear, you do it from the handlebars which send the message down to the derailleur system. The derailleur system then changes gear for you, so a good one is important. Fortunately, Merax has included Shimano front and rear derailleur’s for easy, safe gear changes, as you ride. Another thing Mountain bikers require is the smoothest possible ride, and Merax Finiss 26 have chosen to use 26″ wheels here, instead of 29″ and this was a good choice for an entry level mountain bike. 26″ is what most bikers preferred since bikes with these wheels are easier to control, and go better over bumps. Single-walled rims don’t provide much protection for wheels and frames. The double-walled rims on the Finiss 26″, have that extra layer of protection needed, and will save buyers money in the long-term on frame repairs. Mechanical disc brakes, a new in the world of biking, and offer much more braking power than rim brakes. A greater degree of control and better braking speed will be noticeable immediately. Excellent inclusion, which enhances safety, and will increase durability because mechanical brakes wear less on the frame. Buyers want a smooth ride, whether it’s uphill, downhill, straight track, or around corners. Gone are the days when it was acceptable to produce bikes you had to awkwardly shift into position, to change direction, and the Finiss 26″ provides easy miles. The Aluminum frame allows for a low weight, so the Finiss is going to be very easy to ride, but Aluminum is also durable, so it’s the perfect material for a Best Mountain Bike. Complimenting this, are the 26″ wheels. The more miles you do, the more you start to notice that larger wheels absorb shock less, and so the ride becomes bumpy when it doesn’t need to be so. 26″ wheels make downhill sections easier and produce a smoother ride. It was good to see the Aluminum Frame, combined with 26″ wheels for the best ride possible. Of course, ease of operation means very little without good design. Your comfort bike should feel like all its parts are working together. Merax made some smart choices here and made this happen. For example, they chose Shimano derailleur’s to go with the Shimano gear system; it’s always better to go with one company, especially with Shimano, who have a proven track record. The link between the derailleurs and the handlebar gear control has been well put together too. So if you drop your bike, little damage will be done. The designs mechanical disc brakes come to improve riding on rougher, fast terrains, where brake speed is required, and they are the most popular braking system on the market presently. The power is incredible, so for quick turns, down winding tracks, it’s going to be a superior and easier ride, because of the excellent design. Perhaps the only downside of the Merax Finiss 26” is that mechanical disc brakes will require a bit of getting used to for riders who haven’t used them before, but the rewards are plentiful. Use a rag once a month to clean your derailleur’s, and clean anytime you hear a squeaking sound because this means grime or dirt has gotten into the system. Cleaning will allow riders to maintain optimum speed in gear shifting. Move your body with the bike as you go around corners, and shift your weight back going uphill. This will enhance speed and is a general tip for all Mountain Bikers. Use both brakes, not just one, as this will make shopping easier and it’s also safer. Take some time to get used to the mechanical brakes, because they do pay off, once you’re familiar with them. Once you have mastered the brakes, you have a good mountain bike for the money; it’s light, durable, safe, has amazing brakes and great wheels.